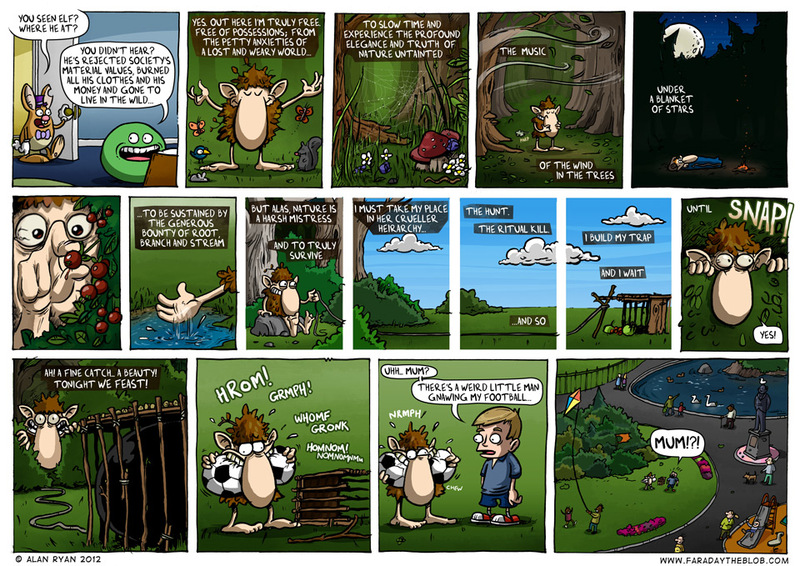 This entry was posted on Sunday, February 12th, 2012 at 12:07 am and is filed under Comics. You can follow any responses to this entry through the RSS 2.0 feed. You can skip to the end and leave a response. Pinging is currently not allowed. (but I was kind of thinking he should have been gnawing on the kids leg… call me cruel). Sandy – Ya know, I never thought of it! I must be in danger of mellowing out, gotta watch for that. Fantastic art work and made me laugh out loud! Love it! Loved the storytelling and art on this one! Excellent art and clever story! Heh, well there’s a bit of death in the next one alright… I must say I do like the idea of a ridiculously over the top fight scene, it would take me right back to the early pre-internet days of Faraday when every single comic resulted in his spectacularly gruesome demise! Park life is so harsh.